Today I was getting a little peckish - not just hungry, but peckish as in irratated. I have always found cooking rather therapeutic and what better than today to spend an hour in the kitchen preparing this. We all know that risotto takes a bit of patience. It's not as straightforward as rice, you know chuking it into a pan, boiling and then simmering it for 15 minutes. It needs more attention, quite a bit more in fact. Adding one ladle of stock at a time and stirring until each addition is absorbed - that's where one needs patience. If you don't have time on your hands this may not be the dish for you, if however you can give 40-45 minutes of your precious time towards this then you will be able to stir up a delicious meal and also be very happy with the results. 1. Peel the prawns, reserving the heads and shells. 2. Melth half the butter in a large frying pan. Add prawn heads and shells and stir-fry for 3-4 minutes. Strain the butter and return to pan. 3. Add a further 25g butter to pan and add onion and garlic. Sauté for 5 minutes until softened but not coloured. 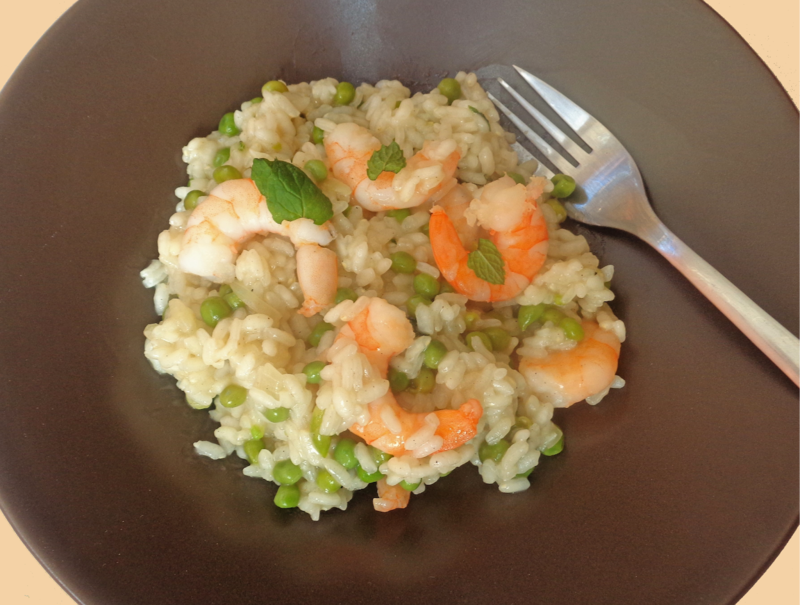 4- Add risotto and stir well to coat grains with the butter, then add peas and pour in the wine. Bring to the boil and cook until wine has been reduced by half. 5. Add the stock, a large ladleful at a time continuously stirring until each addition has been absorbed into the risotto. Continue this method until risotto is creamy but grains are still al dente. This should take about 20 minutes. 7. Cover pan and leave risotto to rest for a few minutes before serving.